Penrith Harmony is a group of highly enthusiastic men based in the Greater Penrith area and beyond, west of Sydney. We come from all walks of life and age groups with our common interest being a love of a cappella singing in four part Harmony Barbershop style. As well as performing regularly at local community events, we compete in local, national and international competitions with other groups from all over Australia and the Asia Pacific region. Our repertoire is wide and varied and includes both traditional and contemporary songs. Along with singing in contests, Penrith Harmony also performs for community and corporate events, fund raising shows and in concerts as the main or supporting act. We delight audiences with our diverse repertoire which is delivered with the passion and enjoyment experienced by each performer. 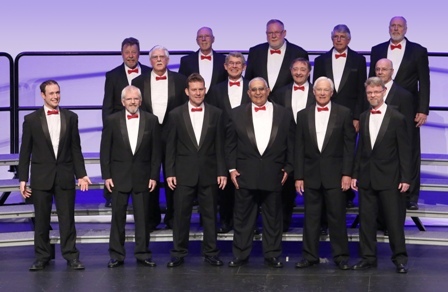 Penrith Harmony is a spirited group of men working towards a common goal of musical excellence to thrill and charm audiences. The chorus attracts members from a range of ages, backgrounds and employment: from university students, to business professionals, to retirees, and it provides them with new musical challenges regardless of their level of accomplishment. Barbershop music is a unique style of a cappella 4-part harmony comprising the Lead who carries the melody, the Bass who sings the lowest harmonising note, the Baritone who completes the chord and the Tenor who harmonises above the melody. When all 4-parts in a quartet or chorus are in perfect balance, a “ringing” or overtone sound is produced. This “ring” is a joy to the singers and audience alike. Barbershop music is also about presentation and often props and choreography are used to enhance the music's message and entertainment. Barbershop harmony is a unique and challenging hobby, but one that is also extremely fun and rewarding. It is built around a chord structure that is emotionally satisfying to both the listener and performer. It allows you to express yourself through choreography and artistic interpretation of music. It involves a level of energy and physical engagement not usually found in other choral forms. Barbershop encourages you to engage with and entertain your audience, to enrich the lives of yourself and others. And anyone can do it! You don’t need to be able to read music or have sung previously. Anyone of average singing ability will find a part that fits their vocal range. When you gather ordinary voices into a chorus or quartet, the result becomes greater than the sum of the parts. Penrith Harmony is committed to protecting your personal data and will use any personal or sensitive data we collect from you. In Europe, this is in line with the General Data Protection Regulations (GDPR). Penrith Harmony collects data from individuals to help us plan, organise and run the day-to-day operations of the group (e.g. co-ordinating rehearsals or collecting subscription payments) and to promote and market the group’s activities (e.g. marketing mailing lists and photography/video capture). This data will be used by our admin team to manage your membership with Penrith Harmony and to organise and run our activities. When you sign-up to our marketing mailing list we will ask for your email address and will use this data to send you information about our events and activities (e.g. upcoming events, latest news, etc). We will only send you information that is related to Penrith Harmony. (i.e. we will not use your data to send you marketing messages from 3rd parties). If you purchase an event ticket, or Penrith Harmony merchandise, or make a donation, we need to collect data on the person making the purchase. This data will only be used for administering your booking/purchase/donation, and will not be used to send you marketing/promotional messages from the group. The Penrith Harmony data retention policy is to review all data held on individuals at least every two years and remove data where we no longer have a legitimate reason to keep it.